Even though now there are problems. But having problems is not a problem. It’d be great if all cars were cheap and if the MRTs never break down. And if we had a better idea of who we really are as a people so we wouldn’t need to disagree or be confused at the smallest things from how our National Day Songs should sound to how many foreign immigrants we should accept. Those are definitely problems, but that doesn’t mean they’re bad. For one, the influx of foreigners may have diluted our overall identity, but in some way the Singaporean core has also been reinforced. Now we have something to see ourselves with, a foil against which our own culture and uniqueness reflects and shines. One cannot help but feel that much happier when the person you’re ordering food from replies in that familiar Singaporean lack-of-accent. Or if you spy that tired yet hopeful gaze that characterises the Singaporean psyche looking back at you on the way home on the MRT. It is that tone of voice and that look in the eye that instantly reveals how we’re the same – that we were born here, raised here, and will probably die here, and know much better how each other feels, even if we’ve never spoken. It’s a spiritual, national connection that’s slightly more difficult to build with someone who hasn’t quite gone through the exact same environment you’ve grown up in. Because you can no longer take another person in Singapore being Singaporean for granted, you learn to treasure it so much more. And times are trying but that’s okay. Things are getting difficult now but when have they ever not been? Singapore 1965 – ousted, alone, tiny. Then, we all felt that moment of anguish. Of when our entire survival as a nation was at stake and our previous attempt at fitting into a larger regional entity had failed. But we came together and persevered and accepted the tough times ahead of us. We accepted how some of us will never own the homes or live the lives we wanted but that was okay as long as, together, the nation progresses. As long as the next generation could grow up to live theirs. We never let defeat defeat us. The older generation worked and worked and worked hard to build what we have now. And maybe the younger generation can finally chase their dreams because their parents gave up theirs. And we have already achieved success beyond our wildest imaginations, if you look at the amazing transformation we’ve had in the last 48 years. Did that even seem possible 48 years ago? If we seem to be failing now, it is not because we have failed, but because our definitions of success are changing. And that’s good. Singapore has always been next to an impossibility. Given our size and our resources we were never supposed to be where we are now, were it not for clever economic planning, the aiding forces of globalisation, and, really, all the sacrifices we made. Our people may look soft on the outside, constantly complaining, yielding to ‘government policies’ but inside we are tough. We are a people who have experienced war and confrontation. We are a people who have lived through conflict, battled with identity, and wrestled the consuming forces of global economics. We are generations of sons, brothers, fathers and uncles who’ve known first-hand what it’s like to be conscripted, to live in war when there’s peace, and of daughters, sisters, mothers and aunts who’ve seen their relatives through what Service really is, and who’ve supported them through each of the 24 months. The danger is not that we become weak, but that we forget how strong we really are. That we start to think we can’t continue on with such phenomenal growth. That we let ourselves get carried away with success and BMWs that we lose sight of what is really important. That we don’t realise the future for us will only exist if we create it for ourselves. That people start to see this country as a nation headed toward disaster, and fulfil their own prophecies by leaving. There’s a difference between actually failing, and simply succeeding less. 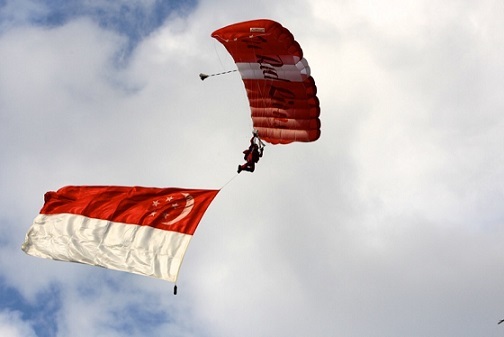 In the army, they say each day Singapore has not gone to war is another day the army has fulfilled its mission. Likewise, given our history and geography, each day we live in racial harmony, each day we do not find ourselves struggling for food and clean water we do not naturally have, each day we find ourselves being able to live our own lives and not sacrifice them for the survival of the nation, that is one day in which we have succeeded. Granted not every day is like that, and it seems now that such days are getting less and less, but that doesn’t mean we have failed. It means that the time for hard work isn’t yet over, not even after 47 years. Being young and small means we’ve still got a long way to go. It means we need to constantly push forward all the while unsure of and lacking experience in what we’re doing. It means the odds are against us. But it also means potential. It means each one of us is just one out of five million, not five hundred million, and it means having a blank slate on which anything can be drawn or written. We, more than any citizen of bigger and more solidified nations, can be the masters of our own destinies. That’s why amidst all this, it’s great to be Singaporean.